NO.1 brand is not idle, and soon unveiled more information about a new smartwatch called NO.1 G4. NO.1 brand introduced to rich portfolio another model of the smartwatch. We had an opportunity to test one of the models of smartwatches NO.1 called NO.1 A10 (review here). And we can say that the company knows what he’s doing and has a big potential. Therefore, the more we expect a new SmartWatch and new models smartwaches from NO.1. 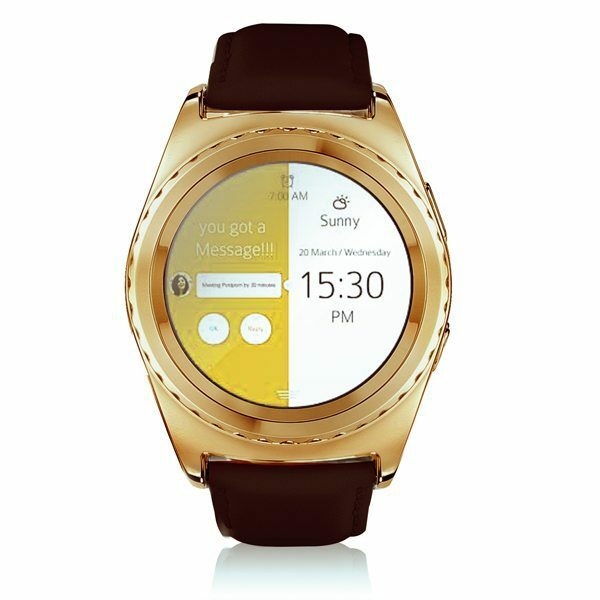 The NO.1 G4 is a new round smartwatch equipped with MediaTek MT6261 chipset. G4 smartwatch will be available in black, white and gold watch and a brown belt. Smartwatch will support SIM card for phone calls. How betrays NO.1 brand retail price will be only $ 40 (nice!). We hope, and even we’re absolutely convinced that the G4 smartwatch succeed sale. For the price of $40 probably we get all the existing features familiar from the NO.1 G3 which visually resembles Samsung Gear S2 and also has a very reasonable price (on Gearbest for $57.89). Probably G4 will have features such as pedometer, sedentary reminder, sleep monitoring, watch faces, heart rate monitor and more. Unfortunately there are no more information about the specifications G4 smartwatch. We hope that will be soon on the website NO.1 brand. On the other hand at the moment you can see some pictures NO.1 G4 smartwatch.